Intent: Add some flavour to the Shadow Knights and an Eldorai cult I subbed. Image Credit: Unknown. Tineye sends me to Ben Wotten on Deviantart, but the image no longer seems to exist there. 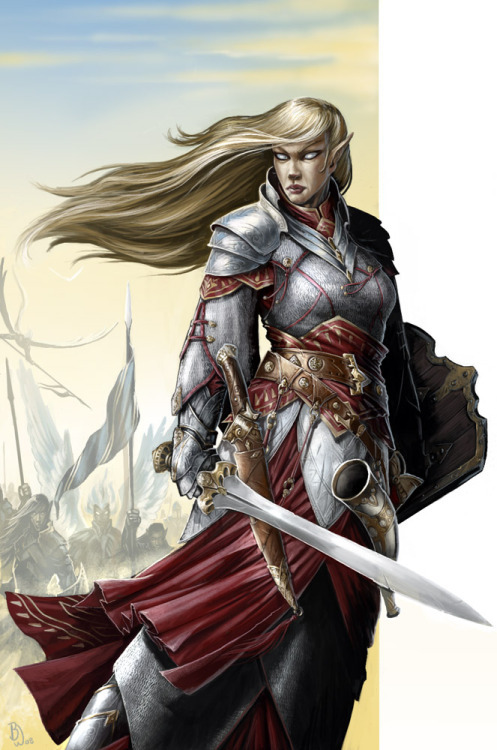 Google image sends me to Pinterest and a Tumblr called 'Women Fighters in Reasonable Armour'. Ben Wotten is linked there as well, but the link is broken. Role: Anti-Force-User Unit, elite infantry. Links: Somewhat inspired by the Sisters of Silence from 40k and this Chaos submission. Eldorai. Unit Name: Watchers of the Night. Affiliation: Harbingers of Twilight, Emissaries of Illyria, Shadow Knights, Tynan Vanoth. Lionheart armour, Verpine prototype shield. Mk1 Bolter (with APE Rounds), Reaper Shotgun or Magnetic Repeater. Squad Automatic Weapon: T-21 light repeating blaster or Pulse Cannon. Specialised: Mk3 Heavy Bolter or Rotary Cannon. Mission-specific: Czerka headbanger, Stockhli spray stick, Carbonite rifle. Blaster pistols, Sonics, Cylix bolt pistol or Magnetic Revolver. Grenades, Blast bug, Plasma eel, de charges. Strengths & Weaknesses: The Watchers are a well-equipped, skilled unit, specialising in combating hostile Force-users. They are characterised by bravery, skill and fanatical zeal, viewing their mission as a religious calling. They are all Force-Dead Eldorai, completely void within the Force. They have no presence within the Force and thus cannot be sensed in it or mentally manipulated. They possess an immunity comparable to that of Vong and their biots, meaning they are unaffected by most Force powers targeted directly against them. Even a normally powerful telekinetic blast that is capable of launching an ordinary opponent off their feet at high speeds simply causes a Yuuzhan Vong either to stumble, or lose balance temporarily. Their Force Dead nature can give them an advantage over Force-users in combat. However, while being void in the Force is a great benefit, it also has all the associated drawbacks as they cannot be aided by the Force either. Thus if an ally were to use Battle Meditation, that would be no help to the Watchers. Trying to communicate via telepathy or heal injuries with the Force will not work on them. Moreover, they are not immune to Force Lightning and can be indirectly affected by the Force. To name some examples, during the Yuuzhan Vong War Jedi were able to cause Vong to suffocate by making the air super dense around them or increase the air pressure to a degree that they were effectively crushed. Moreover, chucking a boulder obviously still works against Force Dead and Vong because them being a void in no way affects the fact that a giant rock is being thrown at them. Naturally they can also be sensed via Vongsense. For unknown reasons, Force Net also works on the Force Dead. In short, all the Force techniques that work against Vong and other Force Dead also work against the Watchers. Moreover, they are a very small unit and cannot be deployed in large numbers. They are focused on specific threats: eliminating or containing hostile Force-users, Sithspawn and the like. They can obviously fight conventional threats given their training and equipment. But their small numbers would leave them at risk of being overwhelmed in larger engagements. Enemies may not be able to match them on a one-on-one basis, but could overwhelm them in numbers. Moreover, their reliance on heavy armour leaves them vulnerable to guerilla tactics, as they lack the mobility of light infantry. For the same reason, using snipers, land mines and heavy weapons is a good idea. Their armour is tough, but they are not meant to engage 'heavy' formations of armoured vehicles like tanks and walkers. Being infantry, they are vulnerable to air strikes and artillery. While strong on their own, they will need support forces in larger engagements. Heavy power armour also makes them ill-suited for stealth and obvious targets, since enemies will see and probably hear them coming. These suits enhance their strength, but also make them less agile than light infantry. The Watchers are a blunt instrument, comparable to a broadsword or a war axe, and thus unsuited for operations that require subtlety. The price of freedom is eternal vigilance. One potential threat to freedom and livelihood is posed by Force-users. They wield awesome power, but often with little responsibility. They can cause great devastation. Ergo, they must be watched. The Emissaries of Illyria are unique among Eldorai cults for being extremely distrustful of Force-users. They worship the Death Goddess Illyria, who was banished into the underworld for rebelling against the Creator Goddess Ashira. To conservative Eldorai, she is a mother of demons. To the Illyrians, she is the first rebel, who took up arms against an unjust order. The Emissaries are dominated by a radical warrior cult called the Harbingers of Twilight. Originally they were a secret commune of Illyrians on Kaeshana. Exiled by Queen Tirathana VI for heresy, they were captured by Yuuzhan Vong slavers. Gruelling experiments turned them Force Dead. At least those who survived. At first they were slave-soldiers, then they rebelled and broke their chains. Over time they came to see their transformation as a blessing. Conservative Ashirans called them soulless, for Sciia is both the Eldorai word for the Force and soul. But they claimed that they had broken the shackles of Ashira and were now able to commune with the Mistress of the Underworld without being manipulated by the whispers of spirits. To Ashirans, the Force is a flame they can tap into due to being gifted by Ashira. This belief was turned on its head among the Illyrian radicals, as they cast Ashira as the Great Oppressor. The Emissaries have a three tiered approach: Force Dead, Force-Blind, Force-User. Force-users are not turned away, but regarded with suspicion and distrust, for it is believed that they must strive to resist temptation, lest they succumb to the whispers of the spirits and abuse their powers. For this reason, the upper ranks of the church are closed to them. To quote an influential cleric, "Blessed are those whom the spirits do not haunt, for only in silence is the word of the Mistress heard. Favoured are those who do not hear the spirits, for in ignorance can the true word of the Mistress be taught. Cursed are those who are seduced by the spirits, for in such ways is the benediction of the Mistress forgotten, and personal vainglory predominates." When Kaeshana was devastated by a huge asteroid and the most Eldorai fled to Tygara, the Harbingers came to the aid of the survivors who had been left behind. They entered into an alliance with the Shadow Knights, a group of dissidents and rebels who wanted to protect the Forsaken. This forced compromise on them, for they had to tolerate and work alongside Force-users. It was a bitter pill to swallow, but necessary for the greater good. However, though they had agreed to cooperate and not force their condition on anyone, the Illyrians remained vigilant. Their religiously motivated distrust aside, Eldorai society had been historically dominated by Force-users. Galactic history was full of cases of them going out of control. An instrument was needed to watch the mages, keep them in check and hunt those who succumbed to the siren call of the spirits. Some of the most dedicated, capable Harbingers came together and swore a solemn vow. They would form a covenant of sword sisters, dedicated to protecting the Eldorai from errant mages and the mages from themselves. They called themselves the Watchers of the Night. In addition to hunting down and containing or, if the corruption was too great, eliminating rogue Sciians within the movement, they would protect their people from external preternatural threats. Only on the glorious day when Illyria passed final judgement on the children of Ashira would their vigil end. Lady Death protects. Only the most loyal and martially skilled members would be chosen for this covenant. Like all Harbingers, they are Force Dead. Given the difficult choices they must make in the course of their duty, they must be unswervingly loyal to the order. However, they must not succumb to blind hatred. Instead they would have to realise that those among their people who had been touched by the spirits deserved their compassion...but also their blade, if they turn to evil. In such a case they grant the gift of death, though there is an official preference to capture and contain. The act of killing is a sacrament to their goddess, who alone is able to judge all. A Watcher does not act out of malice, but in service to a greater good. She may be scorned and feared by her peers, but this must not sway her from her course. In the eyes of the Emissaries, the need for the Watchers became more acute when the Shadow Knights were forced to flee Kaeshana in the aftermath of the Kaeshana Rebellion and the planet's occupation by the First Order. They formed a nomad fleet, seeking a new home in the stars. Their numbers soared as elves from various walks of life joined them. Initially the Sisters operated with little oversight from outside their cult, being a closely guarded secret. However, when their existence was exposed to the rest of the Shadow Knight leadership, there was an outcry. The other groups were understandably anxious, fearing that this was an Illyrian conspiracy to take control, purge all Force-users and force their religion on dissenters. After tense negotiations between the Illyrians' high priestess, Fatebringer Tynan Vanoth and Archon Naesala Faethyra, the elected leader of the Shadow Knights, a deal was worked out. This would allow the Watchers to operate, but they would be integrated into the chain of command to prevent actions by rogue operators and abuse of authority. The Archon herself was a Non-Force-User, which made her more acceptable to the Illyrian Cultists. Thus they answer to the Archon, Strategos Yseult Faerin and the security committee of the Citizens' Council. Many Aspirants and a number of Rationalists still regard them with suspicion. The Watchers can only act against fellow Shadow Knights after receiving orders from on high. Their duties require them to work closely with the Redeemers, a punitive, deterrent and intelligence organisation created to protect the Revolution from enemies within and without. Ever since the evacuation of Tygara, the Eldorai have become a nomadic, spacefaring people. Moreover, they have scattered. So the enemies of the Watchers also include Force-users from Eldorai groups hostile to the Shadow Knights. An example would be the Order of the Bright Star, a fundamentalist, reactionary group led by Grand Exarch Valkia Caethina. This group has a very strict theocratic interpretation of the law from the ‘good old days’ along with the racism, misandry, rigid class barries and feudal privileges this implies. Even Ashiran Shadow Knights are deeply hostile towards reactionary monarchists, so the gloves come off if the Watchers have to deal with them. This applies even more to slavers, Sith and so on. The Watchers receive training in how to combat Force-Users, alchemised beasts and the like both in small units and as individuals. They were able to acquire power armour that Firemane had created during the One Sith War. By now the corporation had replaced th suit with a newer design, but it was still formidable. Its obvious protective qualities aside, it would also be intimidating. Their tactics revolve around disorientating and overwhelming their opponents. Their foremost opponent are Force-users, using tried and tested methods and tech to take them out: Firemane Bolters, Shotguns, sonic weapons, flamethrowers and some Vong tech their parent cult was able to get its hands on during the Great Escape. When the goal is to disable and capture rather than kill, Ion Paddle Beamers, stun grenades, carbonite rifles and riot guns come in handy. They are also equipped for melee combat, using vibro-weapons, amphistaves and Sarzmigar polearms. Finally, they carry Eldorai battle shields. Edited by Arekk, 05 March 2019 - 09:58 AM. Another excellent submission. I do not see any problems here.